Gastric ulcers occur when the mucosal lining of the stomach or intestine has been damaged and the strong digestive acids cause painful lesions to form. Two common factors that can contribute to a a pet developing gastric ulcers are Non-steroidal Anti-Inflammatory Drugs NSAIDs (e.g. Deramaxx, Rimadyl etc prescribed to treat inflammation) and accidental poisoning (toxic plants, pesticides, rodenticide, etc.) Other causes include: Infection (bacterial or viral), parasites, IBD, kidney or liver disease and trauma. Unfortunately, your pet may not overtly show signs until the condition becomes severe so it's important to watch for the signs of an ulcer or acid reflux in your cat or dog. The goal of treatment is to relieve discomfort and promote healing of the ulcers. Treatment for gastric ulcers includes: eliminating the cause (stop NSAIDS, remove/secure toxic substances from the home, etc. ), dietary modification and the use of medications and/or supplements. Food allergies can cause inflammation and not only contribute to stomach discomfort but can lead to IBD. Using supportive natural supplements can help relieve your pet's discomfort, protect the mucosal lining and promote healing. 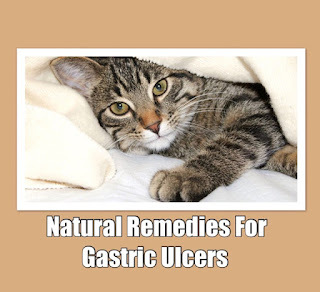 Three important supplements that are helpful for gastric ulcers are Power Probiotic for Pets, Soothing Digestive Relief, and Gastro ULC These natural remedies work together to promote a healthy digestive tract and reduce irritation from stomach acid. Pets that have had an ulcer may tend to be inappetant and have a sensitive tummy. Using the supplements ongoing can help them feel much more comfortable.